The best Hostel i have ever been. Assolutamente soddisfatta! Very nice hostel full of warm and kind people. Everything was clean and tidy and breakfast was very good. I had a great time with the people living and working there. 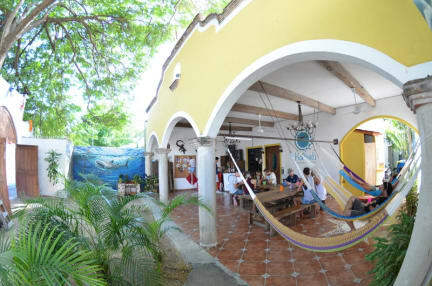 If you are planning to go and stay in Cancun you definitely have to go to Ka'Beh Hostel! Ostello molto carino pieno di gente gentile. Tutto pulito e ordinato e colazione molto buona. Mi sono divertito molto con le persone che vivono e lavorano lì. Se hai intenzione di soggiornare a Cancun devi assolutamente andare al Ka'Beh!!! Il mio viaggio in messico e' cominciato da quest- ostello, non avrei potuto trovare di meglio, ottima location, ottimo personale , una grande pianta nel cortile che permette di stare all'ombra nei momenti di siesta pomeridiana dove il sole e' molto molto forte. cominciare il viaggio dal ka beh hostel e' un buon modo di familiarizzare con il messico e col suo clima... specialmente se patite il caldo. Amazing team, from the owner David to the manager Dan and all the guys of the staff! Wonderful position: less than 5 minutes walking from the supermarket, the bus stop to go to the beach and the square where you can eat typical mexican street food. Each evening they organize events to suit every test: BBQ, quiz, beer pong and much more! But it's perfect as well you want to relax 'cause they have very comfortable hammocks. Hot water, breakfast all day long, impeccable cleanliness. It is such a great place to stay in Cancun. Very friendly and easy going staff. Great atmosphere, with a lot of activities. You won’t get bored..... no matter at what time you wake up the breakfast will be always available! You can cook your meals and enjoy the common spaces! A big thanks also to the hard working ladies who kept the toilets and the rest of the hostel always clean! Well done to everybody!